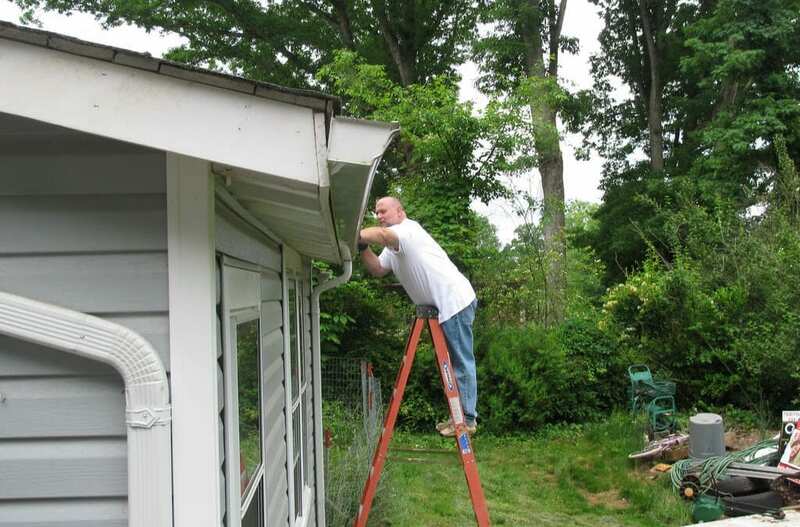 How To Clean Gutters In 4 Steps | American Building Inspectors, Inc. When your gutters are doing their job effectively, you likely aren’t thinking about cleaning them. However, to be sure your gutters provide the best protection from water damage to your property, they do require maintenance. Your gutters need to be cleaned regularly, though how often depends on where you live. If you are in an area where the leaves fall in the autumn, you need to clean your gutters at least once in the fall and again in the spring. Many homeowners don’t know how to clean gutters, so this article will help you learn the ropes. Gutter cleaning accidents are unfortunately all too common, so doing all you can to prevent them is important. Knowing how to clean gutters safely and effectively is important for any homeowner. Learning how to clean gutters starts with choosing the right ladder for the job. Make sure you don’t go any higher than two steps from the top of the ladder, so choose something high enough to accommodate you that’s sturdy enough to hold your weight. For your safety, make sure it is fully extended and not simply leaning against your roof, and that you are on level ground. Get a decent pair of gloves before you tackle your gutters. Gloves will protect your hands from getting cut from the metal edges of an old gutter and from the bacteria that may be found in rotting leaf debris, which often contains droppings from squirrels and birds. This kind of job can be very messy, so having gloves helps you maintain a decent grip while cleaning. Thick suede gloves are ideal for this job, as rubber gloves can tear easily, cotton gloves can easily soak up the dirty water you’re trying to avoid, and leather gloves aren’t as easy to move your fingers in. Most likely you’re going to find a significant amount of debris build-up inside your gutters that needs to be removed. A plastic tool works better than metal because it can bend easier and shape itself to the bottom of your gutters. A gutter scoop is inexpensive and can be found at your local hardware store. A child’s plastic beach shovel is even perfect for the job if you happen to have one lying around. Be sure once you clear all of the debris from your gutters that you flush it out thoroughly with a garden hose. The best kind for the job will be one with a pistol grip trigger so you can adjust the pressure with one hand while keeping the other hand free. Be sure to clean your downspouts at full pressure to check for clogs and clean out any remaining debris. If you’re not sure how to clean gutters, calling in a professional gutter contractor for semi-annual cleanings is a great idea. This can give you the peace of mind you need without the worry of completing the task yourself. You may also want to consider installing gutter guards to reduce the amount of debris that collects in your gutters. American Building Inspectors serves Philadelphia and the surrounding areas with home inspection services. Contact us to schedule your inspection.